Single benchmarks often make it difficult to see the benefit of multi-core processors, since they leave two or three cores sitting around idle. However, the reality is that few people using PCs only carry out one task at a time - they have lots of apps on the go and that's when the true benefit of multi-core processors can be seen. For our first test we run our DivX encoding benchmark while playing back a 1080p QuickTime-encoded video. We record the total times taken to complete the DivX encode and compare them with the original DivX-only results. Naturally, we also take a look at the QuickTime playback, to see if we can spot any dropped frames during playback. 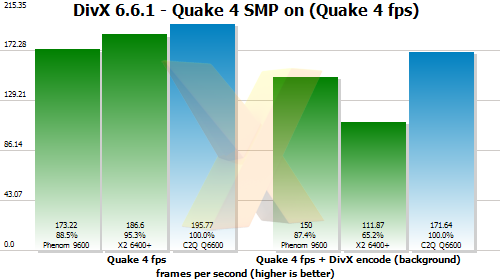 After that, we run the DivX encoding test at the same time as our Quake 4 game test. 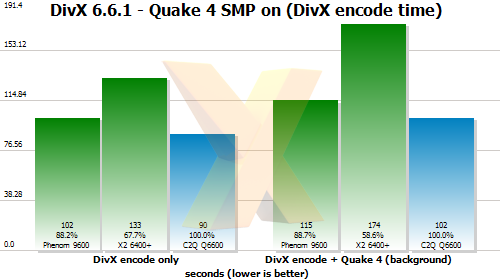 This allows us to see how a heavy, multi-threaded, load affects the performance of the DivX encoding and the impact on the performance of Quake 4. 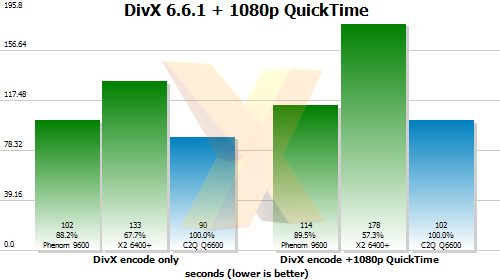 Now, the two sets of bars define standalone DivX performance on the left - as per the benchmark results shown on page 11 - and with 1080p QuickTime also running on the right. What we see is that both quad-core processors expend very little extra time in encoding in to DivX with an additional multithreaded workload running concurrently. The dual-core AMD Athlon 64 X2 6400+, however, is swamped by the multitasking, taking significantly longer to finish. In this case, the Phenom 9600 acquits itself well, finishing around 10 per cent behind the Intel Core 2 Quad Q6600. Here's the same test with multi-threaded Quake 4 running the background. Again, quad-core processors do well, expending little extra time finishing the encode. The frame-rates tally up with actual performance, as Quake 4 was smooth and judder-free on both quad-cores but a little sluggish on the dual-core X2 6400+.